Background: The aim of the study was to investigate the frequency and characteristics of peripheral nervous system (PNS) and central nervous system (CNS) involvement in COPD. Methods: The study included 41 COPD patients and 41 healthy volunteers. Electrophysiological studies were carried out: electromyography (EMG) and visual evoked potentials (VEPs). The median nerve, ulnar nerve, common peroneal nerve, and tibial nerve were evaluated for latency, amplitude, and conduction velocity. Results: The mean age of patients with COPD was 61.8 years and disease duration 10.3 years. There was no difference between patient and control groups in terms of age, BMI, smoking status, or biochemical parameters. Upon VEP examination, latencies were significantly prolonged and amplitudes shortened in the patient group compared to the control group. In EMG measurements, conduction velocity and amplitudes in all nerves were low in the patient group. Similarly, latencies in all nerves were higher in patients with COPD. Conclusion: Central and peripheral nervous system involvement could develop in patients with moderate–severe COPD, and these patients should be monitored for neuropathic changes in combination with neurological examination. Some patients with COPD show neuropathic changes that are distally predominant, mainly sensory, and characterized pathologically by axonal loss, accompanied in some cases by demyelination.2,3 Several studies have reported the presence of peripheral neuropathy (PNP) in COPD.3–7 However, the number of studies evaluating its influence on the central nervous system (CNS) is limited. An evoked potential (EP) is preferred in the detection of CNS dysfunction as it is a noninvasive, easily applicable, electrophysiological method. Visual EPs (VEPs) record the electrical potentials that are produced using flashing light or changing patterns in a monitor from the occipital cortex with surface electrodes and amplifications. The most prominent component in VEP examination is the positive peak wave (P100) that develops at the 100th millisecond and is calculated as a 100-millisecond average in normal individuals. The major finding demonstrating optic nerve demyelination is prolongation of P100 latency. An abnormality in VEP response is seen in many diseases involving the optic nerve, such as multiple sclerosis, systemic lupus erythematosus, sarcoidosis, neurosyphilis, spinocerebellar degeneration, and vitamin B12 deficiency.8–10 However, studies evaluating both peripheral and central involvement in patients with COPD at the same time are quite rare. In this study, we aimed to evaluate the peripheral nervous system (PNS) with electromyography (EMG) and the CNS with the VEP method in patients with COPD and to examine their relationship with each other. The study included 41 ambulatory clinically stable COPD patients at the Department of Pulmonology, Sakarya University Research and Training Hospital and 41 healthy volunteers, and took place between July 2015 and January 2016. Detailed histories were obtained and physical examinations performed on all patients by both a pulmonologist and a neurologist. Patients had been diagnosed with COPD according to Global Initiative for Chronic Obstructive Lung Disease criteria1 and underwent a pulmonary function test (PFT) in accordance with the directives of the American Thoracic Society. All PFTs were carried out by the same technician following the administration of 400 μg salbutamol while the patient was stable. Detailed cigarette-smoking history was taken from all patients. Patients who had diabetes mellitus, demyelinating disease, stroke, neurotoxic drug use, ophthalmological disease, and diseases that could cause neuropathy were excluded from the study. Furthermore, biochemical parameters were examined in all participants, and those with abnormalities affecting the neurological system were not included in the study. Electrophysiological studies were carried out with four-channel computerized nerve-conduction testing (Neuropack; Nihon Kohden, Tokyo, Japan). Effective nerve stimulation used was 0–100 mA with stimulus duration of 50–1,000 μs. Filters were used for motor-nerve conduction (2 Hz–10 kHz) and sensory-nerve conduction (5 Hz–3 kHz), with electrode impedance kept below 5 kΩ. Sweep speed for motor-nerve conduction was 2–5 ms/division and that for sensory-nerve conduction 1–2 ms/division. Patients were allowed to relax in a light- and sound-isolated room. Skin temperature was maintained between 32°C and 35°C. Sensory action potentials of the median, ulnar, and sural nerves were recorded using skin electrodes; compound muscle action potentials and motor-conduction velocities were measured in the arm (median or ulnar nerve) and leg (posterior tibial nerve or common peroneal nerve). During nerve-conduction studies, motor nerves were stimulated at two points along the course and recorded with action potential. An active electrode was placed on the muscle center and placed on a reference electrode tendon. A ground electrode was placed between stimulator and recording electrodes. The measurement of the compound muscle action potential amplitude was made from the baseline to the first negative peak. When the motor-nerve-conduction velocity had been determined, it was used to measure the distance between the points of the two stimulations according to the delay of that section. Sensory-nerve conduction was measured antidromically. Sensory-nerve action potential amplitude was measured from the baseline to the negative peak. Latency was the time from the stimulus artifact to the first negative deflection of sensory-nerve action potential. Sensory-nerve conduction velocity was measured by stimulation at a single site, and calculated by dividing the distance between the stimulating and recording sites by latency. An EP is preferred in the detection of CNS dysfunction, as it is a noninvasive, easily applicable electrophysiological method. VEPs record the electrical potentials that are produced by flashing light or changing patterns in a monitor from the occipital cortex by using surface electrodes and amplifications. The most prominent component in VEP examination is the positive peak wave (P100) that develops at the 100th millisecond and is calculated as a 100-millisecond average in normal individuals. The major finding demonstrating optic nerve demyelination is prolongation of P100 latency. VEP recordings were performed with the Neuropack with analysis time of 500 ms and sweep speed of 50 ms. Low- and high-frequency filter settings were 1 and 100 Hz, respectively. During testing, all patients were seated in a semidarkened room, with the stimulus presented on a television monitor 100 cm from the tested eye. The monitor has the appearance of a draft board in which black squares turn to white and white squares turn to black (pattern reversal) at a rate of one to two times per second. One of the eyes was covered, and the patient was requested to look at the fixation point at the center of the monitor using the other eye. VEPs were recorded from the scalp through silver-cup electrodes positioned at Oz (active electrode) and Fz (reference electrode, 10/20 system). A ground electrode was placed on the right forearm. An average of 200 runs was taken, and each run was checked for reproducibility by a second waveform stored in the memory system. All patients were informed about the aim of the study, and written consent was obtained. Ethical committee approval was obtained from the Sakarya University Medical Faculty Ethics Committee. The study was conducted in accordance with the principles of the Declaration of Helsinki. SPSS for Windows 21.0 (IBM Corporation, Armonk, NY, USA) was used in statistical analysis. In the present study, the continuous variables are expressed as mean, SD, and minimum and maximum values. The Shapiro–Wilk test was used for normality testing of continuous variables. Normally distributed continuous variables were compared with samples t-test, nonparametric variables between the two groups compared by Mann–Whitney U test, and categorical variables compared by χ2 test. A total of 82 participants – 41 in the patient group and 41 in the control group – were included in the study. There was no difference between the patient and control groups in terms of age, BMI, or biochemical parameters. Demographic characteristics of the patients are presented in Table 1. In right-side EMG measurements, amplitudes in all nerves were low in the patient group. Similarly, latency and conduction velocity in all nerves were higher in patients with COPD (Table 2). 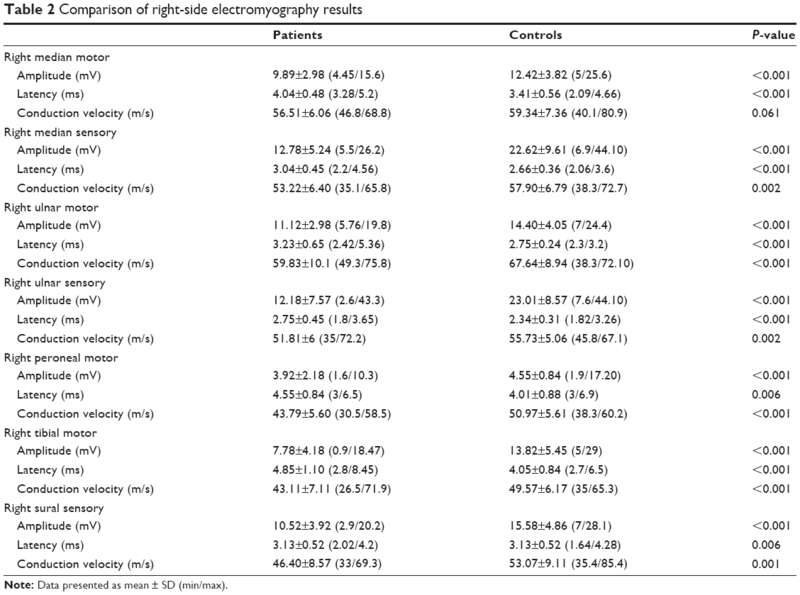 Similarly, in left-side EMG studies, significant differences were detected in all measurements (Table 3). Note: Data shown as mean ± SD and mean (range). Abbreviations: FEV1, forced expiratory volume in 1 second; FVC, forced vital capacity. Note: Data presented as mean ± SD (min/max). Upon VEP examination, P100 and P145 latencies were significantly prolonged in the patient group compared to the control group. However, there was no significant difference in P75 latencies. Amplitude values were significantly lower in the COPD group (Table 4). Healthy individuals outside the 3 SD range in terms of P100 were accepted as abnormal. VEP abnormality was detected in 12 (29.2%) of 41 patients. There was no VEP value outside the normal range in the control group. Abbreviation: VEP, visual evoked potential. Individual COPD patients who had prolongation of P100-wave latency beyond 2.5 times the SD of healthy volunteers and/or a decrease in P100-wave amplitude beyond 2.5 times the SD of healthy volunteers were also analyzed, and the details are shown in Table 5. 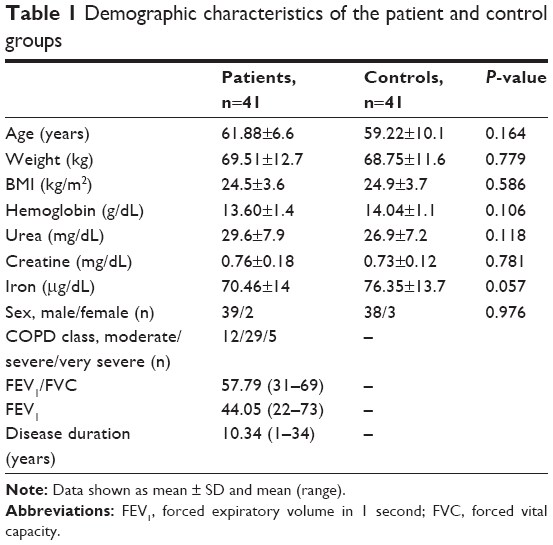 In total, 19 of 41 COPD patients (57.5%) had VEP abnormalities as defined in our study. Prolongation of P100-wave latency was seen more frequently than decreased P100-wave amplitude: 19 patients (46%) had abnormalities in P100 latency and four (7.9%) had abnormalities in P100 amplitude. Notes: Abnormality defined as a variation of more than 2.5 SD from healthy-volunteer mean. Some patients had more than one abnormality. While a total of ten EMG abnormalities were detected in the patient group (24%), only two EMG abnormalities were found in the control group (6.6%). There was no correlation between age, BMI, duration of disease, cigarette consumption, or PFT parameters and EMG and VEP values. Of 12 patients with VEP abnormalities, four (33%) also had EMG abnormalities at the same time. Of ten patients with EMG abnormalities, VEP abnormality was detected in four (40%). However, there was no correlation between VEP values and peripheral nerve-conduction velocity and amplitude values. Although a correlation between COPD and PNP has been reported in many studies, there is a limited number of studies on CNS involvement. Such tests as visual acuity, which are used in clinical evaluation of the optic nerve, are insufficient to determine neuropathic abnormalities that are present prior to development of symptoms. VEP is a sufficiently sensitive method to determine subclinical visual disturbances.14 Additionally, VEP is more sensitive than electroencephalography and psychometry in detecting clinically silent and unrecognized abnormality.15 Ozge et al evaluated optic-nerve involvement in 28 patients with severe COPD.5 They observed significant VEP abnormalities in COPD patients (82.1%) when compared with healthy controls. They suggested that the optic nerve is commonly involved in patients with severe COPD, possibly as part of polyneuropathy. They concluded that VEP abnormalities were related to acidosis, hypercarbia, and airway obstruction, but independent of disease duration, smoking, and age. 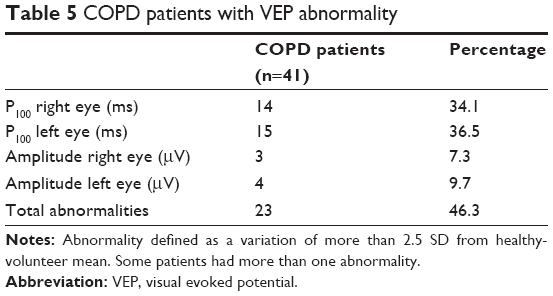 Gupta et al observed significant VEP abnormalities (57.5%) in stable COPD patients with no clinical visual impairment or any clinical evidence of PNP. Mean P100 latency in both eyes of COPD patients was significantly prolonged and P100 amplitude in both eyes in the COPD group significantly decreased.14 In a recent study, P100 latency in COPD patients was prolonged for 3.66 and 2.99 milliseconds over normal individuals in left and right eyes, respectively, with high significance (P<0.01).16 Also, P100 in both eyes correlated positively with spirometric parameters. In the current study, significant prolongation was detected in P100 and N145 conduction velocities in the patient group, similar to previous studies. We detected no significant correlations with EMG and VEP abnormalities and PFT parameters, biochemical parameters, age, BMI, or disease duration. It could be suggested that the reason for this might be the nonhomogeneous nature of the patient groups, methodological differences, and the small number of patients. There is a need for large-scale studies including homogeneous patient groups to determine the factors affecting EMG and VEP abnormalities. The current study is one of few to evaluate both the CNS and PNS. However, the main limitation was that blood gases were unable to be analyzed in the patient group. In conclusion, both PNS and CNS damage can be seen in patients with moderate–severe COPD. Therefore, patients diagnosed with COPD should be monitored carefully for neurological complications with neurological examination and (if necessary) electrophysiological studies. Studies involving relatively high numbers of subjects are necessary to show that COPD is related to nerve-conduction abnormalities. Global Initiative for Chronic Obstructive Lung Disease. Global strategy for the Diagnosis, Management, and Prevention of Chronic Obstructive Pulmonary Disease. Bethesda (MD): GOLD; 2014. Vila A, Reymond F, Paramelle B, et al. [Neuropathies and chronic respiratory insufficiency: electrophysiologic study]. Rev Electroencephalogr Neurophysiol Clin. 1986;15(4):331–340. French. Agrawal D, Vohra R, Gupta PP, Sood S. Subclinical peripheral neuropathy in stable middLe-aged patients with chronic obstructive pulmonary disease. Singapore Med J. 2007;48(10):887–894. Kayacan O, Beder S, Deda G, Karnak D. Neurophysiological changes in COPD patients with chronic respiratory insufficiency. Acta Neurol Belg. 2001;101(3):160–165. Ozge A, Atiş S, Sevim S. Subclinical peripheral neuropathy associated with chronic obstructive pulmonary disease. Electromyogr Clin Neurophysiol. 2001;41(3):185–191. Jarratt JA, Morgan CN, Twomey JA, et al. Neuropathy in chronic obstructive pulmonary disease: a multicentre electrophysiological and clinical study. Eur Respir J. 1992;5(5):517–524. Oncel C, Baser S, Cam M, Akdağ B, Taspinar B, Evyapan F. Peripheral neuropathy in chronic obstructive pulmonary disease. COPD. 2010;7(1):11–16. Grecescu M. Optical coherence tomography versus visual evoked potentials in detecting subclinical visual impairment in multiple sclerosis. J Med Life. 2014;7(4):538–541. Anlar O, Akdeniz N, Tombul T, Calka O, Bilgili SG. Visual evoked potential findings in Behçet’s disease without neurological manifestations. Int J Neurosci. 2006;116(3):281–287. Coppola G, Bracaglia M, DiLenola D, et al. Visual evoked potentials in subgroups of migraine with aura patients. J Headache Pain. 2015;16:92. Faden A, Mendoza E, Flynn F. Subclinical neuropathy associated with chronic obstructive pulmonary disease, possible pathophysiologic role of smoking. Arch Neurol. 1981;38(10):639–642. Moore N, Lerebours G, Senant J, Ozenne G, David P, Nouvet G. Peripheral neuropathy in chronic obstructive lung disease. Lancet. 1985;2(8467):1311. Narayan M, Ferranti R. Nerve conduction impairment in patients with respiratory insufficiency and severe chronic hypoxemia. Arch Phys Med Rehabil. 1978;59(4):188–192. Gupta PP, Sood S, Atreja A, Agarwal D. Assessment of visual evoked potentials in stable COPD patients with no visual impairment. Ann Thorac Med. 2010;5(4):222–227. Emerson RG, PedLey AP. Electroencephalography and evoked potentials. In: BradLey WG, Daroff RB, Fenichel GN, Jankovic J, editors. Neurology in Clinical Practice. 5th ed. Oxford: Butterworth–Heinemann; 2007. Karthikkeyan K, Padma K, Rao BV. Evaluation of visual evoked potential (VEP) in patients with chronic obstructive pulmonary disease (COPD). Indian J Physiol Pharmacol. 2015;59(2):182–188. Nakano S, Imamura S, Tokunaga K, Tsuji S, Hashimoto I. Evoked potentials in patients with chronic respiratory insufficiency. Intern Med. 1997;36(4):270–275. Kajimoto S, Hosomi H, Suwaki H, Hosokawa K. High rate sequential sampling of brain-stem and somatosensory evoked responses in hypoxia. Electroencephalogr Clin Neurophysiol. 1994;92(5):456–461.